OLYMPIA – Legislators have a long-established right to withhold documents connected to their debates and deliberations from the public, but the ability to keep correspondence with their constituents private isn’t as clear, experts told a special task force Wednesday. “The point of legislative privilege is not to protect the constituents, it’s to protect the legislative process,” Stephen Huefner, an expert in public records law from Ohio State University, told the group. But some of the legislators on the task force said the privacy of those constituents – voters who might reveal private information while seeking a lawmaker’s help – was their primary concern. Rep. Matt Shea, R-Spokane Valley, said he wants more transparency, but not at the expense of revealing sensitive information about constituents and whistleblowers. 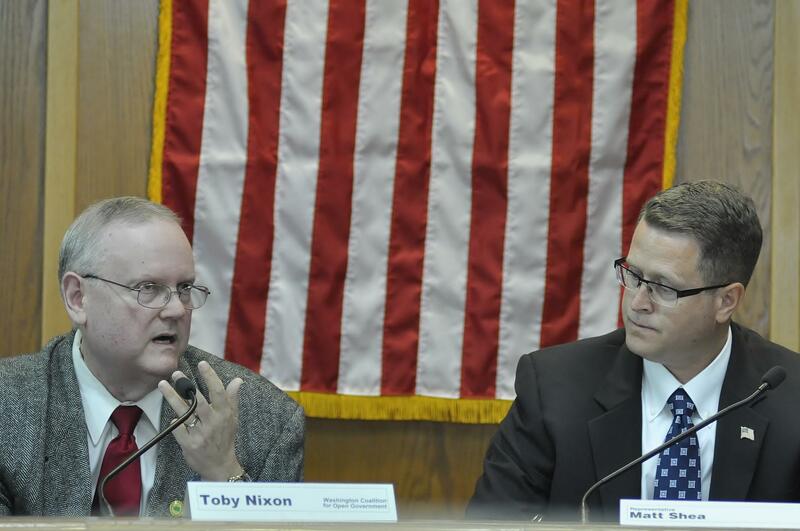 Toby Nixon, president of the Washington Coalition for Open Government and a Kirkland city councilman, said voters called for most records to be available to the public when they passed an initiative in 1972. The mandate of that initiative was that public servants don’t have the right to decide what’s good for the public to know and what’s not good, he said. Sen. Randi Becker, R-Eatonville, recalled a letter that she had from someone detailing abuse a person suffered from a state agency that eventually resulted in a lawsuit. The family would never want that information public, she said. But Diana Kramer, director of student publications at the University of Washington and one of three media representatives on the task force, said she wouldn’t want that specific letter. But if a number of legislators had received similar letters detailing problems at a state institution, that should be made public, she said. The task force is an outgrowth of the Legislature’s unsuccessful attempt to head off a lawsuit from news media organizations in the state, led by the Associated Press and including The Spokesman-Review. Reporters filed public records requests of all 147 legislators last year, most of which were denied with a claim they were exempt. The news organizations sued, and a Thurston County Superior Court judge said legislators are subject to the Public Records Act that I-276 created and many of the records sought would have to be released. With the case pending in the Washington Supreme Court, lawmakers introduced a bill creating special public records exemptions and review processes for themselves, and quickly pushed it through both chambers with minimal debate. But criticism from the news media and the public prompted many lawmakers to change their minds and ask Gov. Jay Inslee to veto the bill, which he did five days later. With the veto, legislators and news media executives agreed to participate in a task force to study the public records law and report findings to the 2019 Legislature. Some task force members hope the group’s four meetings will produce legislation. Rep. Mike Volz, R-Spokane, who serves as chief deputy Spokane County treasurer when the Legislature isn’t in session, said local governments comply with the Public Records Act, although it changes how they conduct business. There are fewer emails sent, and fewer voicemails left, because those are also subject to being released. Instead, government officials are more likely to talk on the phone, or face-to-face. Published: Sept. 5, 2018, 7:35 p.m. Updated: Sept. 5, 2018, 9:50 p.m.